As much as I love my heels, I have to admit, I would toss them any day for a good pair of flats. I heard on the news the other day that high-heels are actually going out of style and being replace with flats or lower heel shoes. Although I highly disagree with that notion, a little piece of me wished it were true. High-heel shoes may not be going away any time soon, but sneakers are definitely in. Brands like Louis Vuitton, Balenciaga, Gucci and even Chanel are all in the sneaker game right now. These brands are charging upwards of $500, with some charging over a $1000 for a pair of sneakers. They have made wearing sneakers with street clothing super cool, and a must wear every season. I know what you are thinking, “I don’t want to spend upwards of $500 on sneakers to look fabulous”! Well you don’t have to spend that much to get the cool-girl sneaker look because a pair of Nike sneakers work just as well if not better! I got my pair for $140 and they do an amazing job of completing my outfit of the day. I wore this look during fashion week, not only was it stylish and on trend, but it was comfortable. 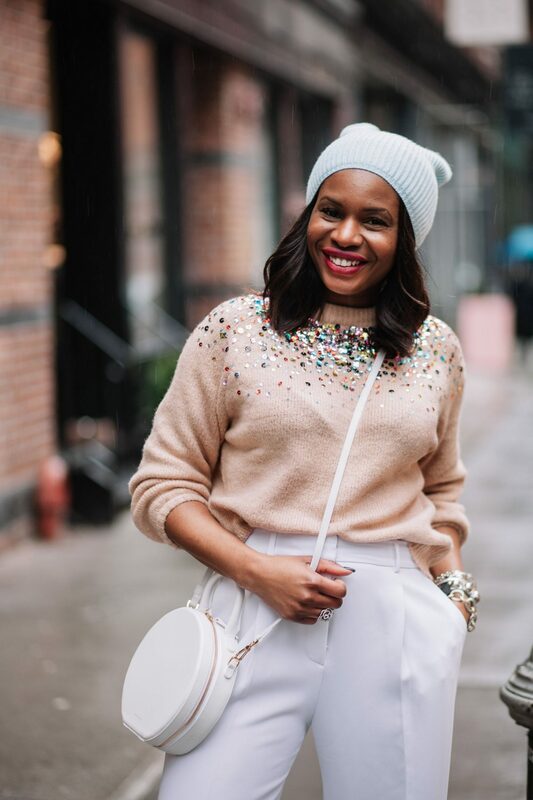 The key to making this trend work, is finding that balance of sporty and chic. 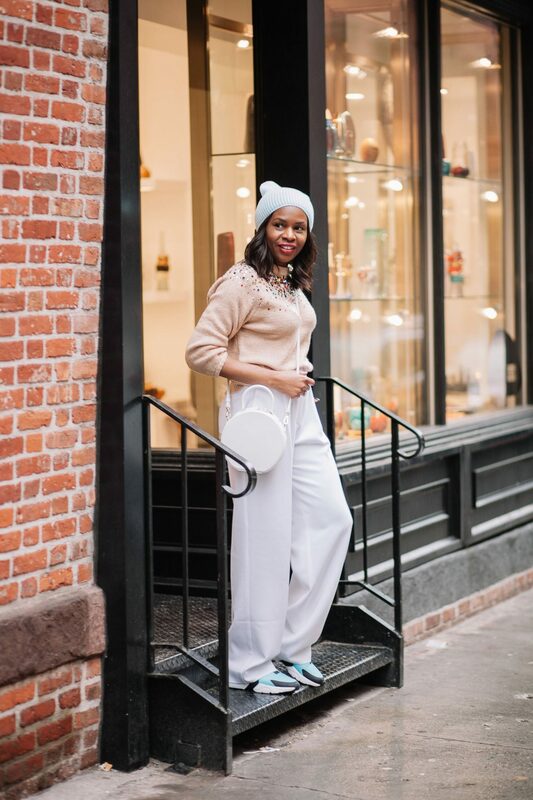 I paired my sporty sneakers with a classic pair of white pants and a classic sweater to elevate the sneakers. 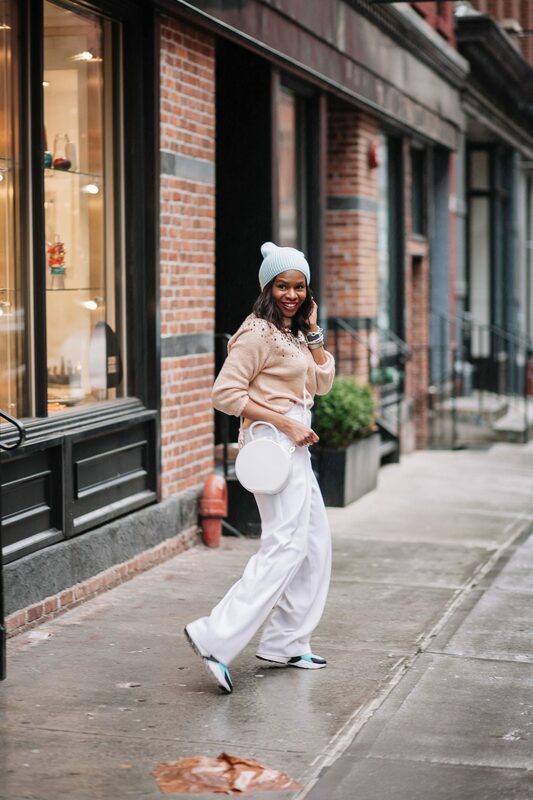 I also introduced some casual pieces like my beanie, and wore my bag as a cross-body to balance the look, and create the perfect casual-cool outfit of the day.